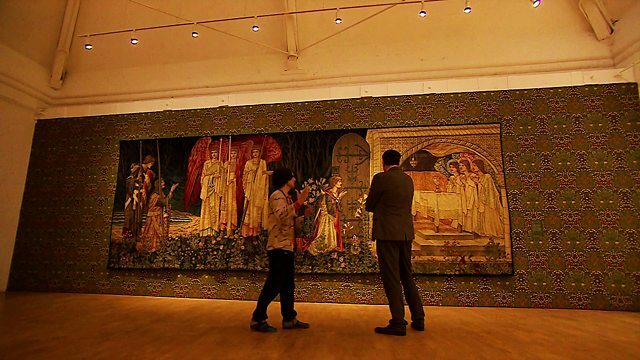 Stephen Smith visits art exhibition Love is Enough for BBC Newsnight. Love is Enough at Modern Art Oxford is curated by Turner Prize-winning artist Jeremy Deller and features his two greatest artistic influences, William Morris and Andy Warhol. Deller discusses the work and influence of Morris and Warhol, who both distributed their work through new forms of mass production and collaborated with other contemporary artists - in the process redefining the relationship of artists to the studio and factory. He also considers the validity of conceptual art, the influence of ideas, how art and politics serve the working class... and reveals that he went to school with English politician Nigel Farage.